The bustling port city of Osaka in Japan is widely known for its commercial appeal, contemporary architecture and thriving nightlife. In the midst of all its concrete modernism, we were overjoyed to come across a home makeover which exudes warmth and cosiness with style. The light garden house was previously a dated and dreary abode with old-fashioned colours and uninspiring textures. But thanks to the architects at Atelier M, the residence now flaunts lavish and smart wooden accents, sleek and trendy designs, lively natural touches, and convenient, functional spaces. Bright and cheery lighting along with provision for welcoming natural light have improved matters too. Intrigued to see more? Then read on! 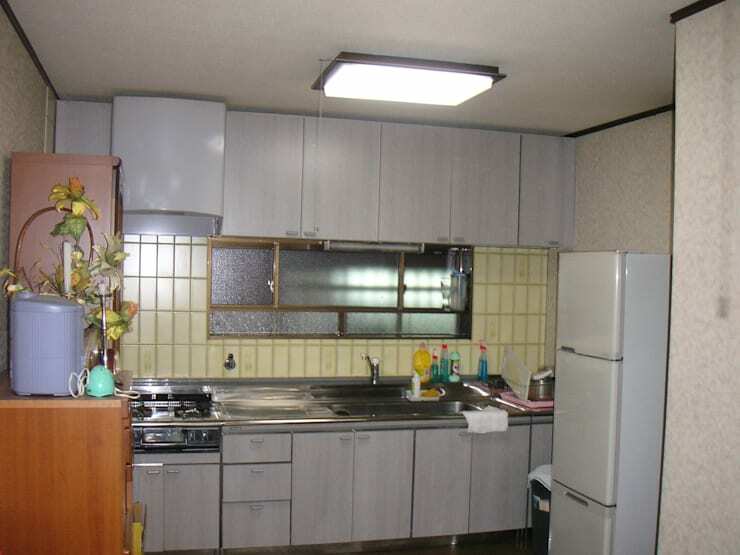 This kitchen and its design reflected the outdated scheme of the original abode. The homeowners might have favoured a conventional look in the kitchen in the past – but sadly it had not transitioned to a more fashionable avatar with time. The grey cabinets looked jaded, while the dirty cream-hued backsplash with its drab tiles looked completely out of place. 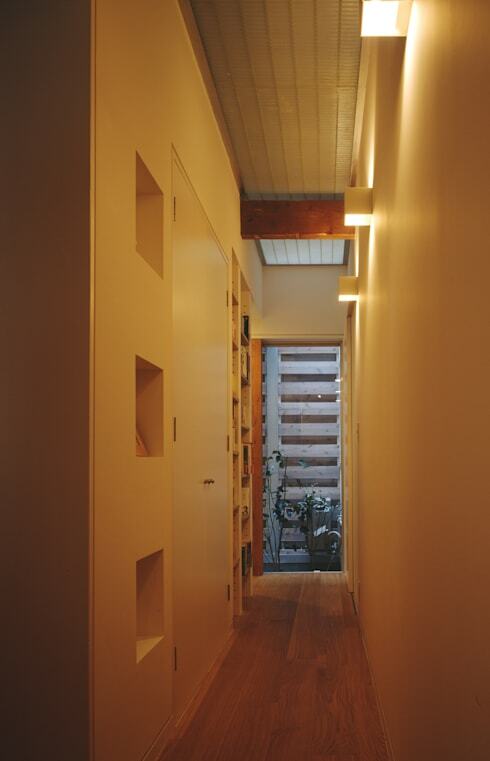 The wooden touches on the side seemed like a forced element and the white light did nothing positive for the space. Clutter and old appliances made things only worse. The new and improved interiors now boast an expansive loft-like look that has been married with a log cabin aesthetic. 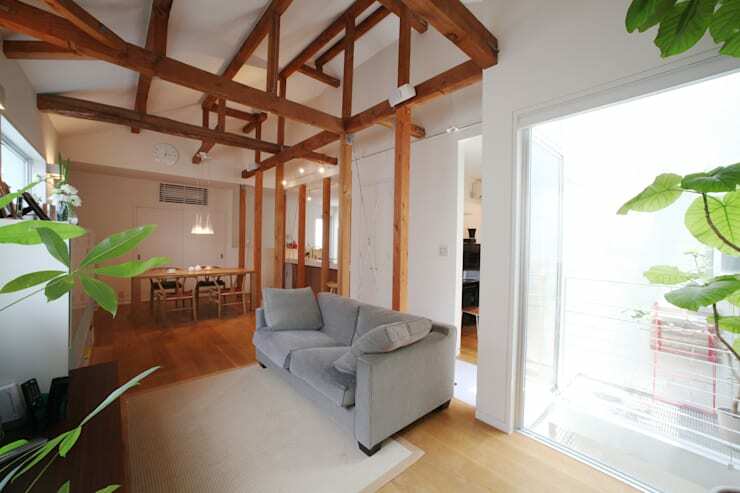 The wooden beams and pillars have an almost artistic effect, thanks to the linear arrangement on the ceiling as well as between the various functional areas. The steel cables knit a diamond like pattern on one side for an industrial look in the space, and to subtly separate the sleek revamped kitchen. 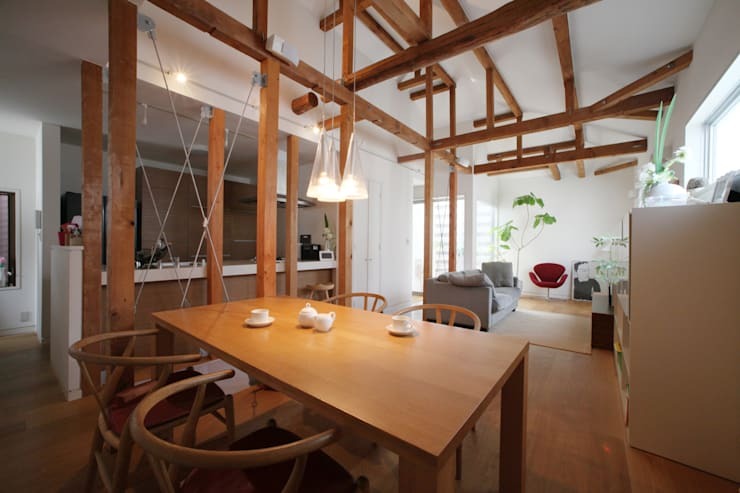 Meanwhile, hardwood flooring and the wooden dining table along with the curvy chair backs make for a whimsical feel. The play of the wooden beams helps in enhancing the beauty of the expansive ceiling, and draws one’s eye to the sheer height of the space. The architects have deliberately kept the furniture lightweight and simple, so that the overhead woodwork takes centre stage. The frosted glass walls on the right side of the couch as well as the greenery ensure that there is a calming vibe in the living area. 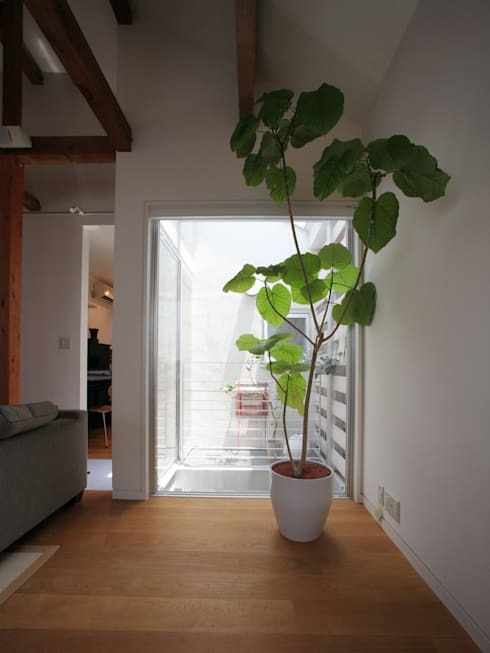 In line with the exposed wooden look of the interiors, this home’s design also brings in plenty of large potted plants for a continuation of the natural feel. This plant in its simple white planter keeps the space looking fresh and organic, and helps in purifying the indoor air. From this vantage point, you can also see the bright and sunny courtyard which takes care of the natural illumination and ventilation of the house. The bathroom features mosaic tiles that make for a textured feel in the soothing space. The half-wall and glass partitions render subtle privacy for the WC unit and bathtub, without compromising the openness of the space. 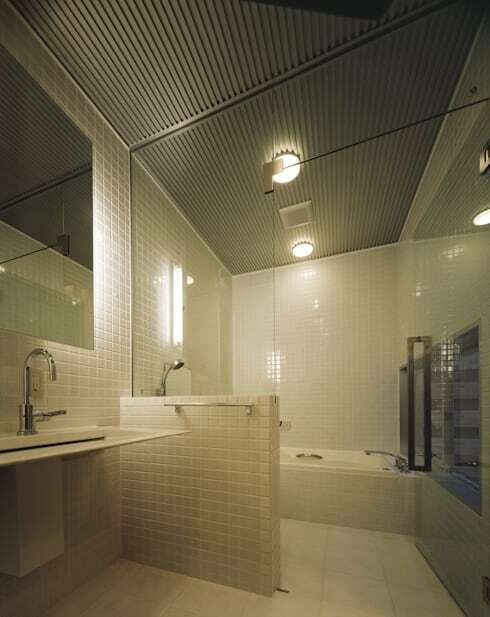 Bright lights, sleek fixtures and a back-lit mirror take the fashion quotient of this bathroom to a whole new level. The corridor that leads towards the simple courtyard and indoor garden has been lined with trendy yet classic-looking niches in the wall while corrugated metal lines the ceiling with golden light flooding downwards. This once drab Japanese home is now not just aesthetically enticing; it stands out due to its quirky and unique woodwork, and focus on functionality. For more inspiration, check out another makeover story: The incredible transformation of a bare home. What do you think of the green touches in this lovely new home?